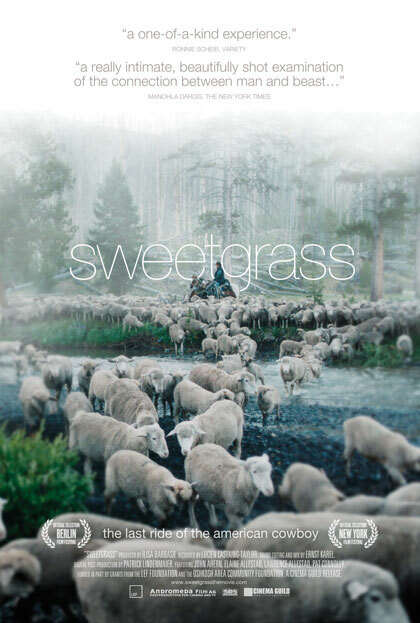 “Sweetgrass begins with a frozen Montana landscape. The man-made structures are mired by the ravages of cyclical time. Sheep suddenly fill the screen, lazily chew and mill about. Have they taken over this barren terrain? One turns its head and looks out over the audience intently. Are we in some post-apocalyptic world a la Planet of the Apes? The explanation is a lot less fantastical, but no less provocative. Ilisa Barbash and Lucien Castaing-Taylor, the documentary film-making couple, train their lens again on rarely seen communities—this time the cohabitation of man and ruminant. When man finally does enter the picture it is as a silent assailant stripping the sheep of their coveted wool or tossing newborn lambs around into sodden piles. However, it is far from a one-sided relationship. Man also feeds the sheep and clothes the young in modified long johns. The first words we hear come in the form of a joke at the expense of the teller and farmers everywhere. Man’s language is brusquely introduced, without the same grandeur as the sheep before them, but this seems to be the point. The filmmakers strive to rediscover the pre-vocal—the camera covets gestures, silences, and songs. We are often led through this world at sheep’s eye view. When a radio pipes in listing Iraqi causalities it is jarring. We are unwillingly snapped back into the modern world. Through the majority of the film we follow two farmhands as they fastidiously watch over the flock on a three month journey up and down the Beartooth Mountains of Montana in search of grazing green. It is a difficult trek beset by rocky terrain, hungry predators, and old-fashioned loneliness. The men are grizzled by the enormity of the task, and they cope by relying on one another. They also take out their frustration on the sheep—never subtle in inventing new derogatory terms to unleash. The sheep stand in for nagging girlfriends, ungrateful bosses, and other annoyances.